But however seriously you take your sauce making – from haute cuisine to humble gravy – you will always need to start with a good stock. Approx 3 litres in volume of chicken bones – can include one or two ham hock bones or beef bones. Include several chicken wings with meat. 500ml plastic pots for putting stock in the freezer – about eight to ten. The day before making stock put your freezer on ‘super freeze’ if you have this setting. Freeze bones in the freezer until there is sufficient for a batch of stock. Start the stock making in the morning. Rinse the bones. Put in a large stock pot and add water leaving space at the top for vegetables. Add around four to six litres of water. Gently bring the pot to the boil and simmer for 20 minutes. Using a ladle, strain the scum off the surface. Chop the other ingredients roughly and add to the stock pot – pushing and stirring to create and even mix. Bring back to a simmer. (Add vegetables after the scum has risen – otherwise the scum gets caught up with the vegetables and it is more difficult remove). Put the pot on a low burner – with a heat dispenser ideally. The aim is to keep the pan gently simmering with just one or two bubbles. i.e. not boiling (which will cloud the stock). Simmer for 2 hrs – 5 hrs – at the lower end the stock will taste fresh and clean like a broth. At the higher end the stock will taste more intense and gelatinous. At two hours all the flavour may not have been extracted from the meat or the veg. Check and continue cooking until there is no flavour left in the vegetables – these can then be removed if further cooking is desired. Remove the stock from the heat and let it cool for half an hour. Strain into another stock pot or other receptacles. Let the bones cool and recycle them. (Time your stock making to a day or two before the recycling collection). 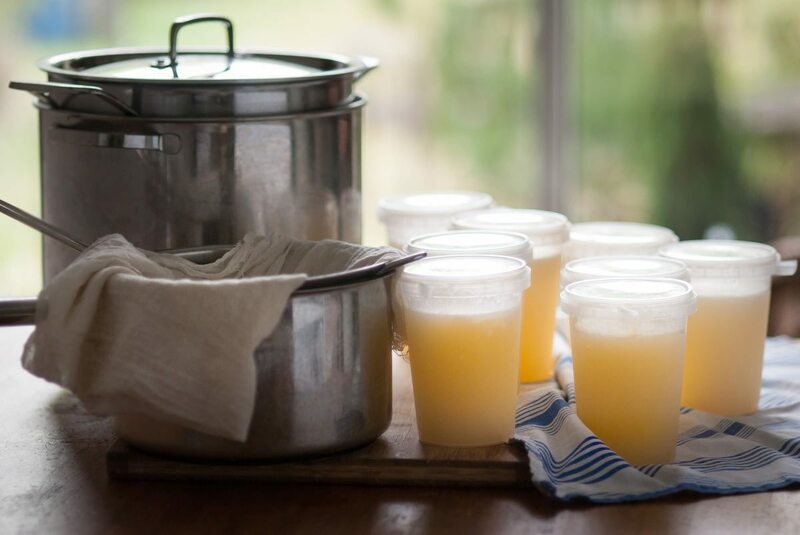 The aim now is to let the stock cool as quickly as possible – keeping it overnight is not advisable as it will start to ferment and a sour note will appear in the taste (especially if using ham bones). When cool strain through a tight mesh sieve, and then through muslin – doing this repeatedly until the stock can be passed through four layers of muslin. The next challenge is to remove the fat that rises to the top of the stock. There are several options: a). do not do anything and keep the fat – it has flavour… b). decant the stock into the pots for freezing and scrape it off when frozen. c). let the stock settle in the stock pot and use several kitchen towels to remove the fat. Quite effective but not entirely so… d). put the stock in the fridge in sauce pans and wait till the morning and break or scrape the hardened fat off before putting in pots for freezing. I have used all methods – it’s mox nix. Decant the stock into pots for the freezer. Store in the refrigerator overnight to lower the temperature of the stock. Transfer the pots to the freezer. You may need to do this in stages if your freezer is on the small side or you suspect that the stock will lower the temperature of the freezer sufficiently to affect the other food. The stock can be kept in the fridge for three days – if you need to keep it longer re-boil it and cool before storing again.